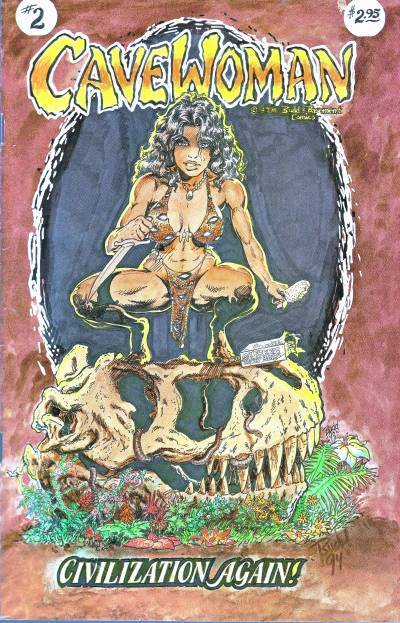 "Cavewoman: Rain A comic that is much better than it might appear at first glance, Cavewoman seems at times part Wonder Woman, part Jurassic Park, and part Night of the Living Dead. As this second series begins, the town of Marshville has been transported back in time to the age of the dinosaurs. Meriem Cooper (a.k.a. Cavewoman) had been transported back to this age when she was a young girl by her grandfather, using a time machine he invented. The idea was to let her escape her abusive mother, but when her grandfather died, she was stuck in the prehistoric era for years. When she was nineteen, however, the entire town of Marshville was transported back to join her. Unfortunately, the townspeople are not nearly as adept at survival in the wilds of prehistory as Meriem, and find themselves being picked off, one-by-one, by packs of roving dinosaurs. Luckily, the problem isn’t too bad in the heat of summer…but the rainy season is just about to begin." - ComicBase™ 7.0.